The labor group Partido Manggagawa (PM) asked the global union body, the International Trade Union Confederation (ITUC), to investigate recent cases of violent dispersals of strikes and harassment of striking workers. The ITUC had listed the Philippines as among the worst countries for workers in its 2018 Global Rights Index. “If the ITUC report had noted very recent developments like the violent dispersal of the strike at NutriAsia and the harassment of picketlines at Lakepower Converter and Dong Seung in the Cavite export processing zone, the Philippines might even rise from being number 8 to number 1 in the list of worst countries,” stated Rene Magtubo, PM national chair. Magtubo was referring to the police dispersal last week of the picketline at the condiments giant NutriAsia that led to the arrest of a dozen workers and the wounding of several more. While in the strike at the electronics factory Lakepower Converter, two women workers were hurt when company and ecozone security guards repeatedly attacked the picketline in the dead of the night last December 2017. In the strike at the garments factory Dong Seung last month, ecozone guards tore down placards in the picketline and prevented striking workers from entering the Cavite export processing zone. “All these incidents of impunity against labor rights at NutriAsia, Lakepower and Dong Seung are in blatant violation of the DOLE-PEZA-PNP Guidelines in the Conduct of Security Personnel During Labor Disputes. The guidelines was a reform enacted in response to findings by the International Labor Organization High Level Mission in 2009. Unfortunately the guidelines remain a piece of paper,” insisted Gerry Rivera, head of the newly established Kapatiran ng mga Unyon at Samahang Manggagawa. Last Monday, some 200 members of PM and Kapatiran marched to the NutriAsia factory in solidarity with the striking workers. The groups are calling for a boycott of NutriAsia products such as Datu Puti, Silver Swan, UFC and Mang Tomas. Tomorrow mediations meetings are to be held to resolve the pending disputes at Dong Seung and Lakepower. The DOLE National Office is calling the company and union of Lakepower to a meeting due to the termination of all seven union officers this month despite an agreement forged last April to reinstate all striking workers. Also the National Conciliation and Mediation Board in Cavite is meeting the management and union of Dong Seung because of the dismissal of 16 union officers. “The mass termination of union officers at Lakepower and Dong Seung are black-and-white examples of union busting by companies. 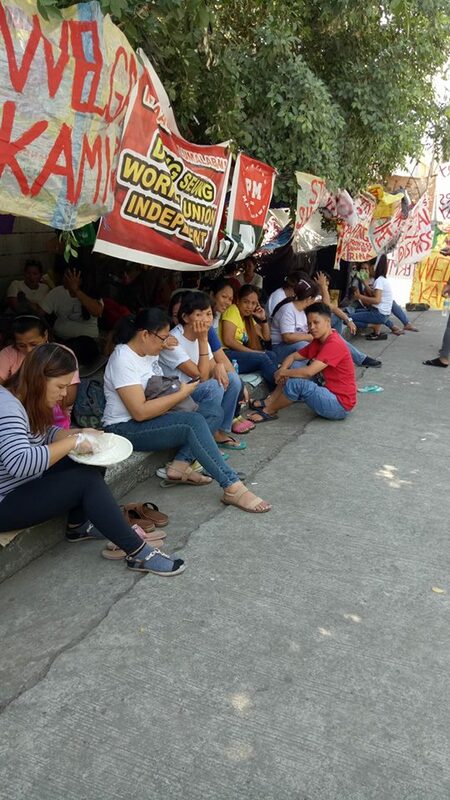 Workers in NutriAsia, Dong Seung, Lakepower and others are organizing in order to improve wages and working conditions but the response of employers is to suppress freedom of association,” concluded Rivera.